Australian emergency agencies aim to be high reliability organisations – that is, to be consistently relatively error-free and make consistently good decisions which result in high quality and reliable operations. To this end, they use an emergency management system known as AIIMS – Australasian Inter-service Incident Management System, designed to enable the integration of activities and resources from several agencies – when responding to critical incidents. 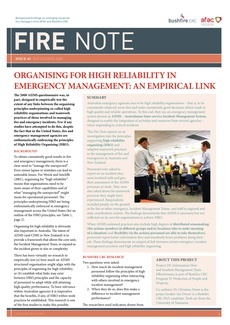 This Fire Note reports on an investigation into the principles supporting high reliability organising (HRO) and adaptive teamwork practices in the management of fire and emergencies in Australia and New Zealand. Personnel were asked to report on an incident they were involved with and give their assessment of the AIIMS processes at work. They were also asked about the teamwork practices they might have experienced. Respondents included people on the ground at the fire or other emergency, Incident Management Teams, and staff in regional and state coordination centres. The findings demonstrate that AIIMS is necessary but not sufficient on its own for organisations to achieve HRO. When AIIMS-endorsed practices also include high degrees of distributed sensemaking (the actions members in different groups and/or locations take to make meaning of a situation) and flexibility (in the actions personnel are able to take themselves), personnel report better information flow and manifestly fewer problems doing their job. These findings demonstrate an empirical link between certain emergency incident management practices and high reliability organising.